Ramesh is barely 2-years-old and is at the risk of completely losing his eyesight if he can’t continue his treatment. He has already lost vision in his right because of eye cancer. 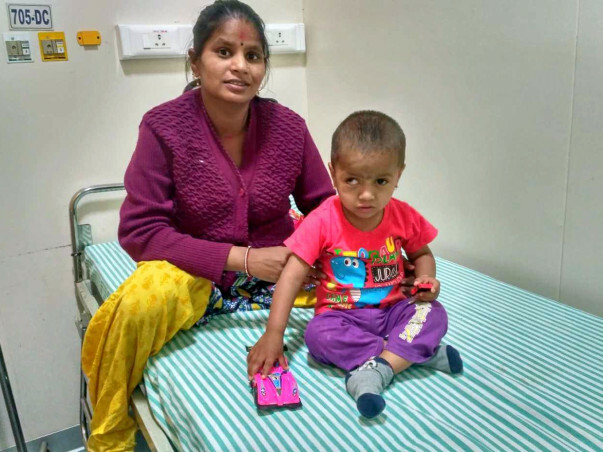 Ramesh has started chemotherapy to prevent the tumour from spreading to his left eye, but his father, Hanumanth, is finding it difficult to continue his treatment. 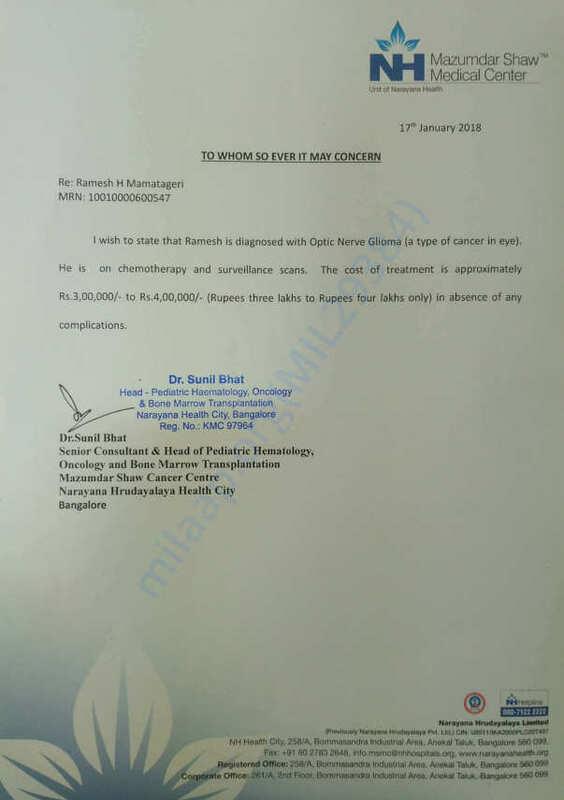 Ramesh needs chemotherapy to save his eye. 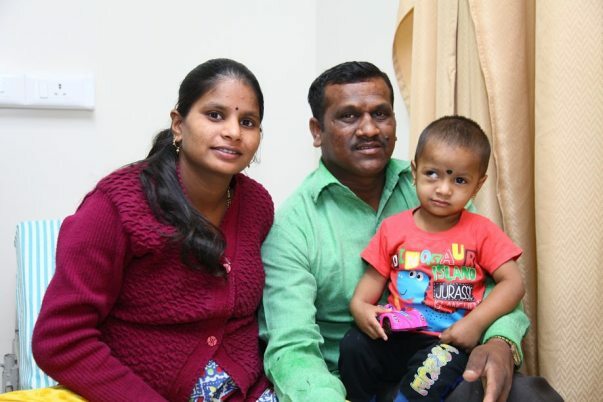 Ramesh was only 5-months-old when Hanumanth noticed redness and swelling of his right eye. He quickly took him to a doctor, who asked him to get further tests. Several scans later, the doctors told Hanumanth and Kaveri that their baby has eye cancer. The news left them devastated. “He’s our only child. We were so happy to start a family when Ramesh was born, but our happiness was so short lived. When I saw that his eyes were red, I thought it might be a regular infection. I never thought that it would be cancer. We're now afraid that he will live in darkness forever." Ever since his diagnosis, Ramesh has spent most of his time in the hospital. He hasn't known a normal childhood and has grown up with medicines, instead of toys. Even then, Ramesh remains cheerful and enjoys whatever little time he gets to play. Ramesh had an eye surgery 3 months ago, and his condition has improved since. While he lost vision in his right eye, there’s now hope for him to save his left eye with chemotherapy. Hanumanth was relieved when he was told his baby’s eye could be saved, but he was also overcome with worry. Hanumanth knew the amount for his treatment was well beyond his reach and he had no means to pay for it. Hanumanth and Kaveri only have each other to lean on in these arduous times. They have somehow managed to pay 1 lakh for their child’s treatment but now can’t afford anymore. They need 4 lakhs for his treatment. Hanumanth works as a driver in Bangalore and doesn’t earn enough to support Ramesh’s medical bills. No matter how desperately he wants to save his son, their dire lack of funds is stopping him. 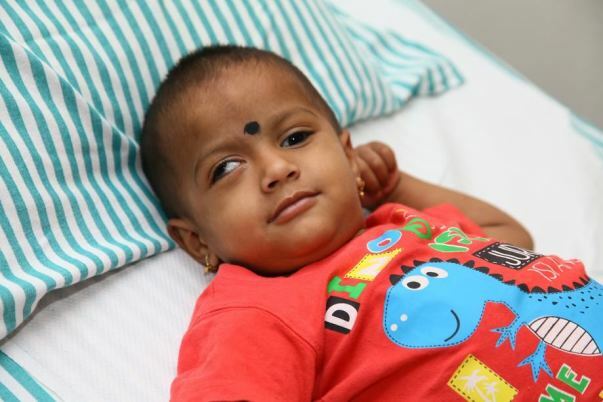 Baby Ramesh needs to continue chemotherapy to save his eye. He has already completed 3 cycles and needs more to prevent the tumour from spreading. Ramesh’s condition has been improving after surgery and chemotherapy, but Hanumanth has exhausted all his savings. He’s now pleading for a helping hand to save his only son. Ramesh has Optic Nerve Glioma that can rapidly deteriorate his ability to see with his left eye if not treated immediately. Ramesh has already lost vision in his right eye, and without chemotherapy, risks going completely blind. Hanumanth longs to see his child free from the deathly clutches of cancer, but he can’t afford the 4 lakhs needed to continue his treatment. Your support can save Ramesh from cancer. Here's an quick update on Ramesh. He is doing ok and is currently at home. She comes for his regular follow ups. We would like to inform you that Ramesh has completed his chemotherapy treatment and is on regular follow up. He is showing signs of recovery. We will keep you posted on his condition further. Ramesh is still on chemotherapy and he is showing signs of recovery. We will keep you posted on his condition further.